Dean Court Hotel, York. 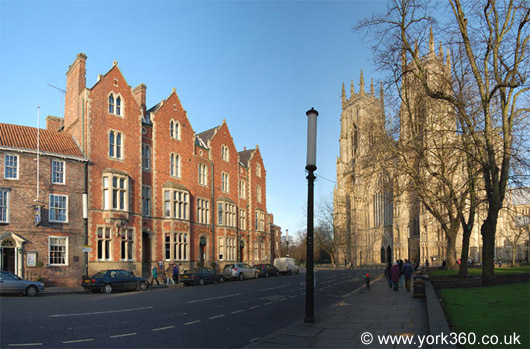 ~ Duncombe Place, Next To York Minster ~ York 360° ~ Best Western Dean Court Hotel. AA 4 Star Hotel. The Dean Court Hotel has the most enviable location in York. Just yards away from the grand west entrance to York Minster, with its famous stained glass, including 'The Heart of Yorkshire', heart-shape window. The Minster never fails to impress and is one of the most beautiful cathedrals in England. York's many visitor attractions are an easy walk from the hotel, including the Viking Centre, National Railway Museum, Shambles, River Ouse and many more..
Dean Court Hotel has 37 individually styled guest bedrooms, recently refurbished, all en-suite. The hotel has a cafe-bar/bistro and a smart Restaurant. 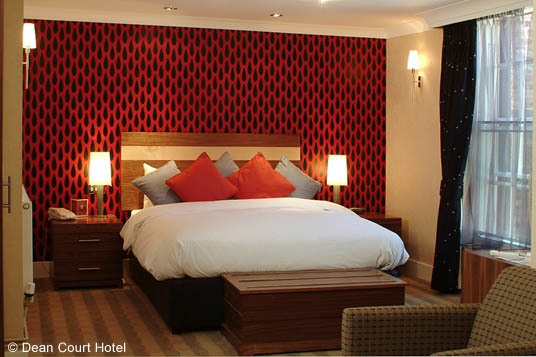 Recent hotel awards include: 2 AA Rosettes and the Visit Britain Silver Award. Dean Court offers a free valet parking service with a private secure car park. Guests arriving by car are advised to park directly outside the main entrance and register at the hotel.